When I first got my new "in colors" I was SO stuck on Rich Razzleberry. Then I ventured away for a bit and played with Dusty Durango. It seems that I have discovered a new love for Melon Mambo. I have used it a lot in my cards and crafting stuff. Here I used it to make this SO simple and SO quick card. Using Decorative papers helps when you want to make a quick card. 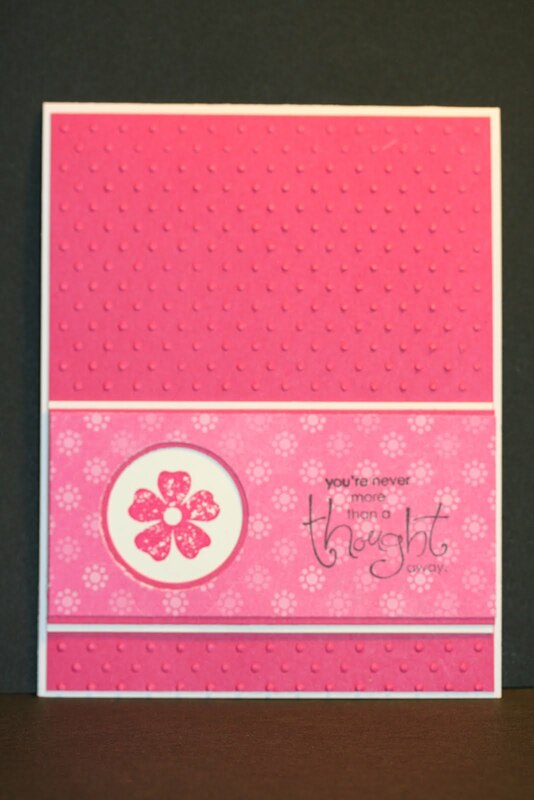 And the embossing folders also help to jazz up a background without making it too busy. And those also let you combine it with decorative paper without giving you the look of adding "stripes and plaids or two different stripes" together. It accents and enhances a card immensely. The image is from the Stampin' Up! "Vintage Vogue" set and the words are from the "Well Scripted" set. Both sets I just LOVE to use and I will be hanging onto them for a long time! This layout is nice and this card is versatile. 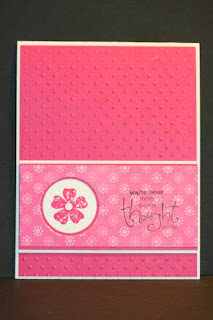 You can use it for many other occasions than just a thinking of you card! Change the image in the circle and expand the uses for this card!